August | 2012 | Run. Work. Live. Repeat. Get out your hankies … this post may tug at your heart if you are a dog lover. It did for me and my family. A few weeks ago I did something out of character: My family and I adopted a dog. The dog’s name was Thor. That’s a picture of him above. He’s an adult lab/husky, about 5-6 years old, from a no-kill rescue here in Colorado. 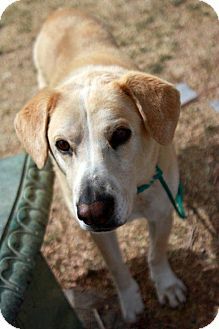 He’s beautiful and will make the right person a great running partner or companion. He and I ran well together while he was in our lives. I consulted with an animal trainer about Thor after the incidents. She concluded Thor wasn’t the right match for us, or us for him, and it would take a lot of rehab to get him comfortable with the little. Even then, it wasn’t a sure a thing. It never is, but it’s especially unsettling when you get off on the wrong paw … A bite would be a disaster for him and us. The experience blind-sided me. I cried like I’d just lost a friend. My kids and I were heart-broken. I realize dogs often don’t know what to make of toddlers, BUT he was fine with my kids. It’s one of the reasons we picked him. Also, I did research on labs and huskies. Both breeds are supposed to be kid-friendly. I was so disappointed when he turned out to be otherwise. Adopting a dog was a leap of faith. I wasn’t allowed to have pets when I was growing up. Both of my parents were born in Europe and they grew up on subsistence farms. In their culture NO ONE kept animals as “pets.” Yes, there were cats and dogs on their land, but they treated them like livestock. My mom, for example, was a shepherd girl. She had a dog, but he was there to herd and protect the family’s lambs from wolves. They didn’t give the dog a name or keep him in the house. My mom still doesn’t get the whole American concept of “pets” and she says they are filthy. To a degree, she’s right. If you’re a neat-freak, dogs and cats are like dumping a barn in your house. But just like running — which we also often do with hearts, not just our heads — being with dogs and living things connects us to nature, and our world, and each other. Dogs and cats don’t just shed hair — they shed light on our humanity; that’s why we’re attracted to them. Dogs, however, are still a great way to show children life lessons in caring as most of us are likely to outlive our dogs. And just like dating, I have learned it’s important to be patient and wait for the right dog to come into your world. That’s exactly how the dog trainer we worked with, Carie Grant, of Denver Dream Dogs, put it. She helped us with Thor and has continued to guide me as we search for our perfect mutt match. I’ll share a picture and our happy ending when we do. Speaking of “dog days” … right around the time we met Thor, the Dude (my husband) broke his collar bone and suffered a concussion while riding his bike and training for an organized race. He was forced to skip the event because of his injuries. He is healing and it is taking time. Tarzan and Jane started school. Tarzan is in first grade, which means he’s big boy now and there all day! That means … it’s a brave, new world for me, both in terms of my work and writing, which you will be seeing a lot more of again on this blog after my summer hiatus. Woohoo!! My next post will be Boston or Botox profile #21, Michelle Moreland Walker, of Evansville, Indiana. Yes, the London Olympics are in full swing. Are you watching them, too? Which events do you like best? I can’t get enough of Missy Franklin (from Centennial, Colorado — a town close to where I live) and Michael Phelps (swimming) or the Fab Five (gymnastics). In just a few more days the running competitions will start. I can’t wait — sprinters, marathoners, decathloners, hurdlers, steepchasers … woo-hoo!! Between the wild fires that raged earlier this summer and the shootings at the movie theater in Aurora a few weeks ago, we’ve had a very rough summer here in Colorado. I am thankful that my family and I are well and safe, but it’s impossible to be a conscious person and not be affected by what’s happened. I will never be an Olympian but watching the athletes makes me want to become a better me. I love this Nike ad, which has aired during the Olympics, and the message it sends: that grace, grit and determination are possible within all of us. My other coping mechanism during this strange, tragedy-filled summer — besides being an armchair Olympian — has naturally been running — preferably with friends and exploring new places. A few weeks ago I got to race in Longmont, Colorado, with Caolan “Chronic Runner” MacMahon, which was a lot of fun. 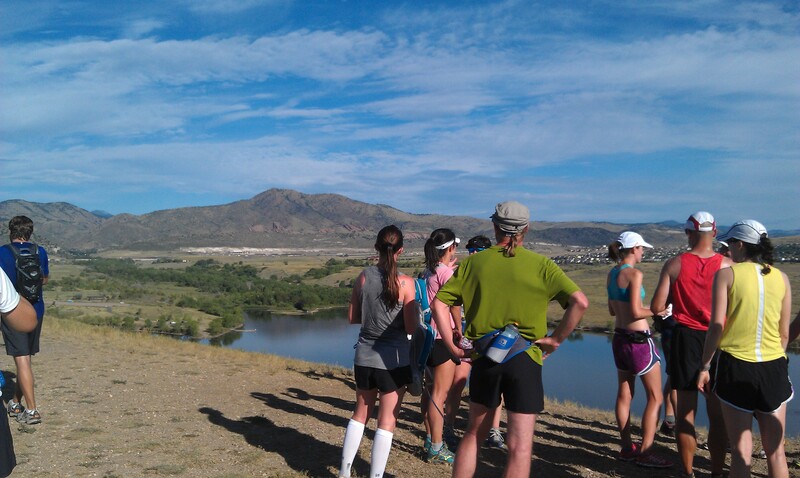 I’ve also run trails on occasion with some of the Columbines, like this one at Bear Creek Lake Park. 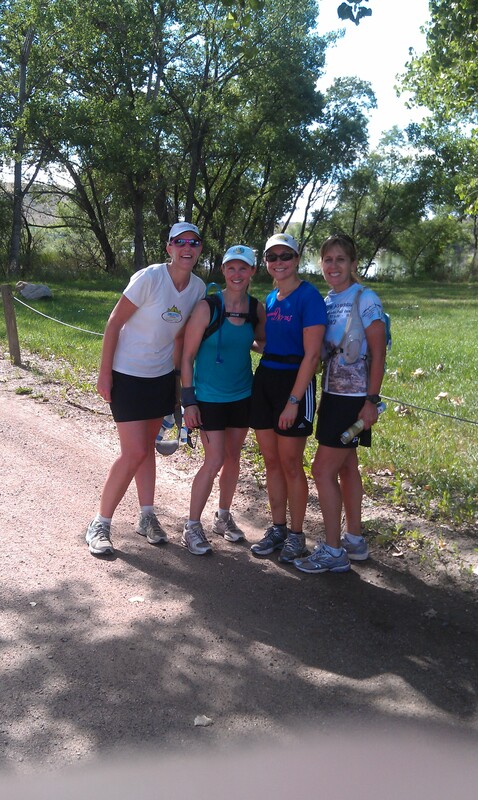 My friends and I after we recently ran a 12.5 loop with a group at Bear Creek Lake Park. 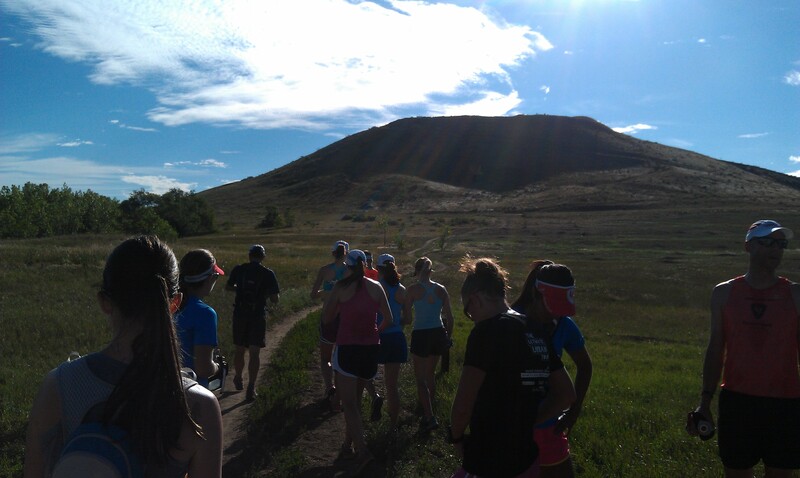 On a group trail run at Bear Creek Lake Park, getting ready to climb to the top of the highest point along the course. The group shown after cresting to the top. 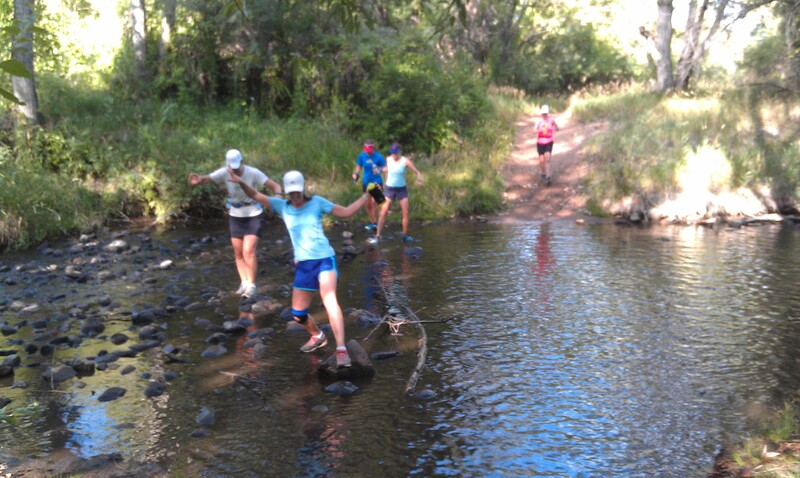 A stream crossing during our group trail run at Bear Creek Lake Park. I hope, first of all, that I make to the starting line of that event healthy enough to do it. 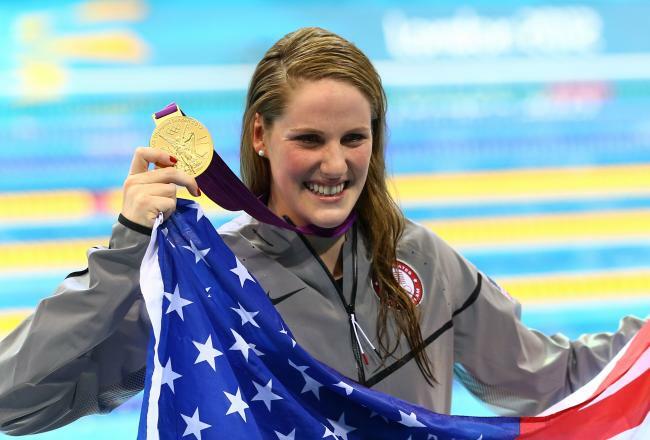 Then my second wish after that is to have a wonderful smile as wide as Missy Franklin’s upon finishing. I’ve got several weeks to keep training and I plan to give it my best. Please wish me luck. What inspires YOU to get out of your comfort zone? Is it watching Olympians? And if you could choose something new to try yourself, what would it be? I triple-dog dare you to tell me about AND THEN DO IT! Missy and the girls are about to swim the freestyle relay and I don’t want to miss it. Go USA!! Thank you, Missy and Michael, and SO many others … for giving us something good to hope for again, especially here in Colorado. Mileage today: 5.5; Mileage for 2012: It’s 11 p.m. and I’m too tired to do math but I promise to fix this tomorrow! !